The first Australian PostgreSQL conference has come to an end and I am extremely happy that I was part of it. 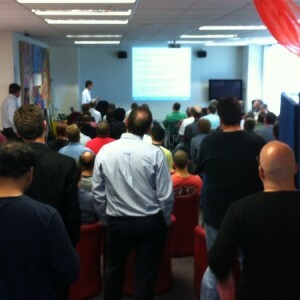 The event took place in Melbourne, at the offices of Experian Hitwise in St Kilda Rd. I must confess that, going back to the same building where I had worked in 2005/2006, was a strange but positive feeling. Hitwise is a long time Postgres user and it would appear that their cluster of PostgreSQL databases has grown to become one of the largest in the world. So, a double-special occasion for me! After the opening session introduced by Jason, Josh Berkus gave an overview of PostgreSQL 9.2 with his “Full throttle” presentation. I followed with an introduction to PostgreSQL, more focused on business reasons for its adoption in business contexts. My talk, entitled “Why use PostgreSQL? 10 reasons for using it”, is the result of several years of experience with Postgres, both as a member of the community and a consultant for 2ndQuadrant. Over the years I have been repeatedly asked questions from both existing and potential new users. From these questions I have tried to form topics and have come up with 10 broad reasons. The last talk of the morning was about the very interesting MADLib library for database analytics. In the afternoon, following Josh’s talk on performance, I brought Barman DownUnder and introduced the audience to Disaster Recovery concepts and methodology using our open source tool developed at 2ndQuadrant. It was a good occasion to promote the new 1.2.0 version which introduces retention policy management. Then it was over to Jason Godden who gave an extended review and coverage of replication tools with PostgreSQL. For some of them he did provide a demo session as well. We were very pleased with the number of participants and overall turnout, considering it was the first event of its kind. At any one time there was always a minimum of 40 participants, while in some cases there were over 60 people present (including of course staff from Hitwise). Finally, many thanks to Jason Godden of the Melbourne PostgreSQL Users Group, who organised the event at the local level and who arranged to have Experian Hitwise host the conference and offer food and beverages throughout the day. I am confident that some PostgreSQL users and fans that were here today in Melbourne can form an active group, led by Jason, and make PGDay a recurring national event.